Nahanni was contracted to be the general contractor on the construction of a new water treatment plant. Due to schedule constraints, the majority of concrete work took place over the winter. Winters in the North are harsh, with temperatures dropping down to -45 degrees Celsius. These environmental factors complicate concrete operations as contingency preparations have to in place so proper curing can occur at sub-zero temperatures. Operations take longer because concrete forms have to be enclosed to ensure proper heat for curing. 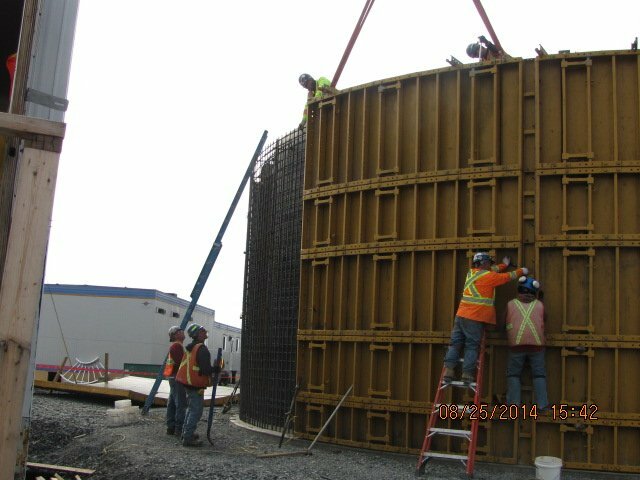 In addition to the winter concrete operations, Nahanni also relocated an existing 60′ lime silo from the site of the old water treatment plant and completed a retrofit of the silo with new instrumentation and structural parts. The silo was then re-commissioned for use in the new water treatment plant. This project took place on a former mining site during current reclamation activities. Due to the nature of the work, environment, and the associated hazards, site specific procedures were developed to ensure compliance with all regulatory requirements and to protect the safety of the work crew throughout the project. Nahanni undertook the mechanical and civil aspects of the work while bringing in a subcontractor to manage the electrical and instrumentation. Nahanni Construction was responsible for managing the scope, schedule, and budget for this entire project from start-up to handover. Nahanni is the general contractor. This is the largest mechanical project Nahanni has undertaken to date. Most concrete work will be completed in the winter where temperatures can reach -45 Celsius. Reaction basin, filter basins, clarifier, and clear well will all be built with reinforced concrete. The project will provide a new 3.41 m3/min water treatment plant located on the historic Con Mine site in Yellowknife, NT. Plant will consist of a raw water pump, raw water pipeline, reaction basin, circular concrete clarifier, filter basins, clearwell, effluent pump, effluent storage tank, processing pipes, office/lab, chemical feed buildings and pre-engineered buildings. Nahanni will relocate an existing lime storage building for retrofit and reuse on the new site. Due to the nature of mine site remediation safe work practices in potential arsenic contaminated environments must be considered throughout the project. The project finished on schedule and budget.